Have you ever felt that sudden rush of joy upon hearing someone who matters to you tell you how grateful they are for what you’ve done for them? How about that uncontrollable smile that forms on your lips whenever you read a simple thank-you note? More or less, we all have experienced this particular kind of basic gladness in some part of our lives. This is how powerful a simple thank-you can be upon our moods. 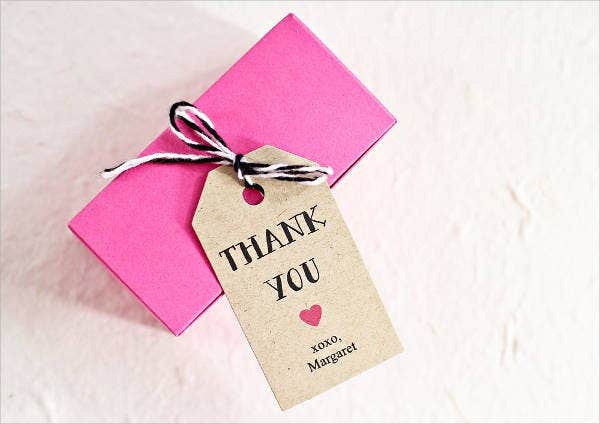 That is why if you are an event planner or a host of a small party, thank-you tags are your best friends in making sure your guests or event attendees will enjoy your event. For your convenience, you may download our easily customizable Favor Tag Templates. 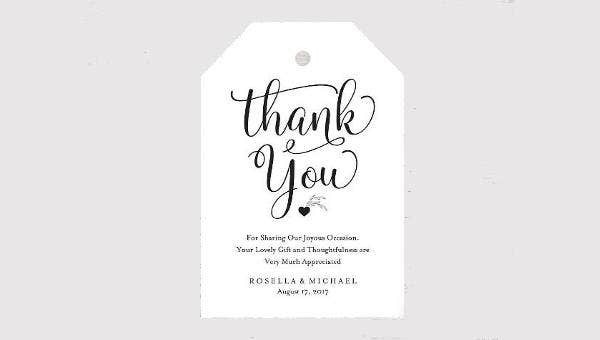 Thank-you tags are expressions of gratitude either for something which a person has done for you or merely for his/her presence in your event. These tags can work their magic best when placed or attached to welcome gifts, goodbye souvenirs, or other tiny gift items. Due to its convenient size, tags are effective in conveying your gratitude without being too obtrusive to the recipient’s eyes. 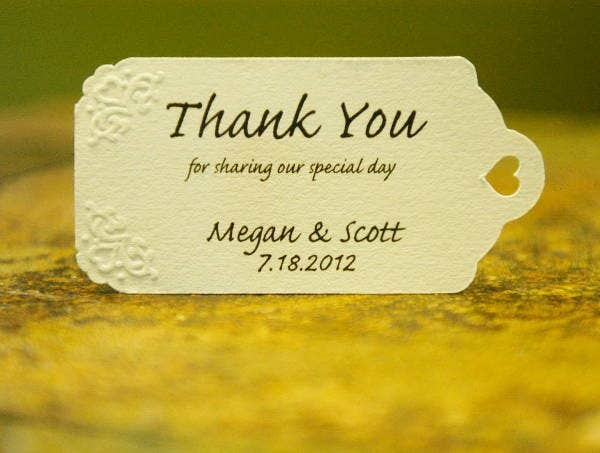 Wedding Thank-You Tag. 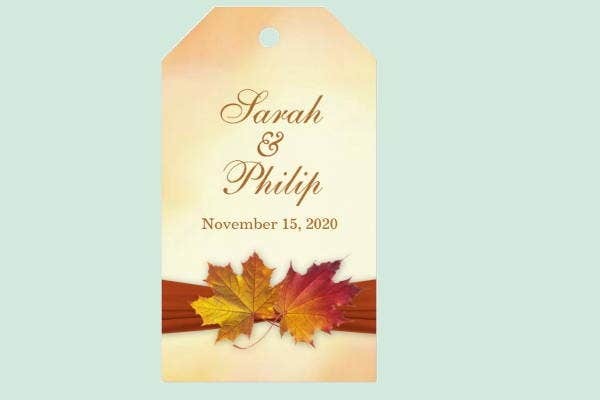 This tag’s understated stateliness makes it perfect for your wedding’s dignified air. You can attach this to tiny gift items to remind your guests for years to come of this wonderful moment which you’ve shared with them. Personalized Thank-You Tag. Calligraphy is always a fun and stylish way to say thank you. Frozen Thank-You Tag. Are you hosting your child’s birthday party? Make it fun and enjoyable for the kids by attaching these Disney-theme tags to the children’s candy-filled party bags! Printable Thank-You Tag. The sketched leaf details are so artsy, you can hang this to your cookie gifts if you feel like randomly being generous and grateful. 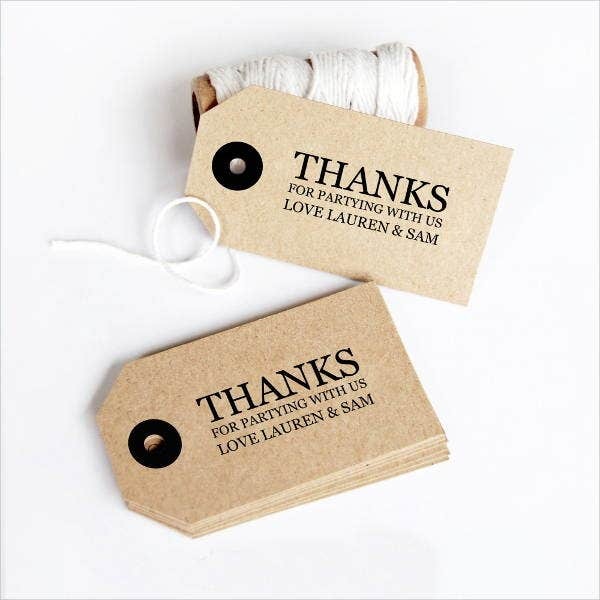 Rustic Thank-You Tag. Brown hues are always cozy and inviting. This tag is perfect for your garden and low-key wedding. 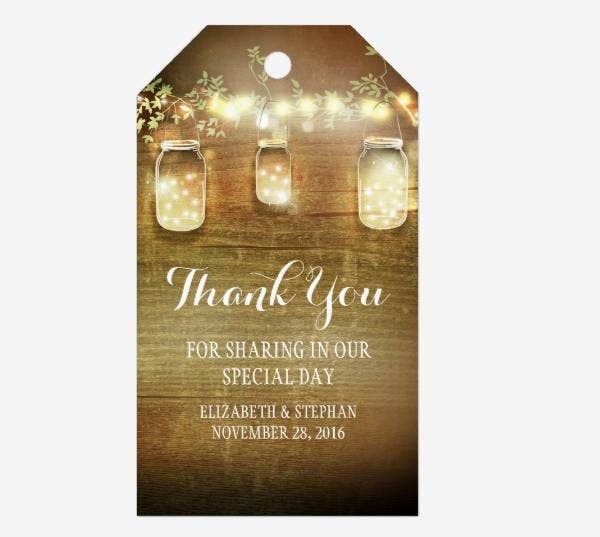 You can add a personalized note at the topmost part to brighten your guests’ day when they see this hanging on a bottled wedding giveaway. 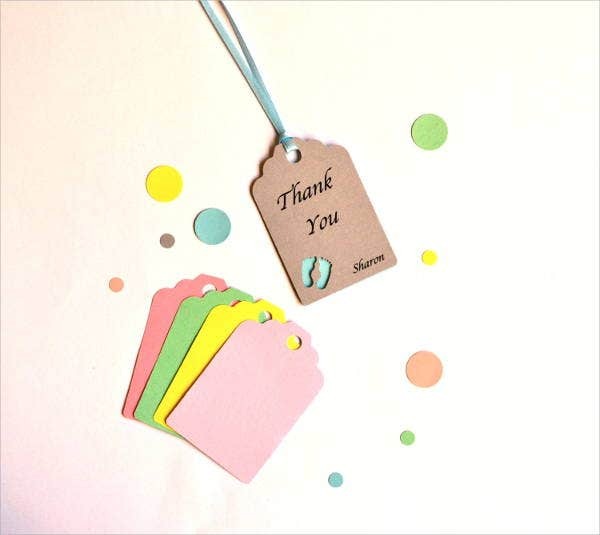 Thank-You Baby Shower Tag. Are you a new parent hosting your newborn’s baby shower? This collection of soft pastel colored tags is perfect for you. The tiny feet detail at the bottom of the tag would make your guests swoon at its inherent cuteness. 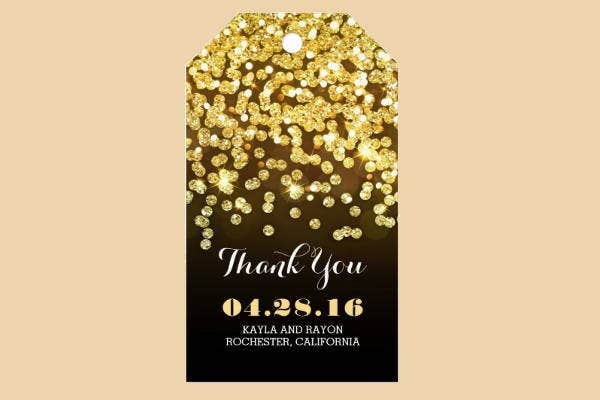 Gold Glittering Thank-You Tag. Glitzy and glamorous, this tag’s extravagance best embodies the spirit of debutante balls, fancy dinner parties, cocktail parties, and engagement parties. The ostentatious details would blend perfectly with your glittery cocktail dresses and expensive giveaways. 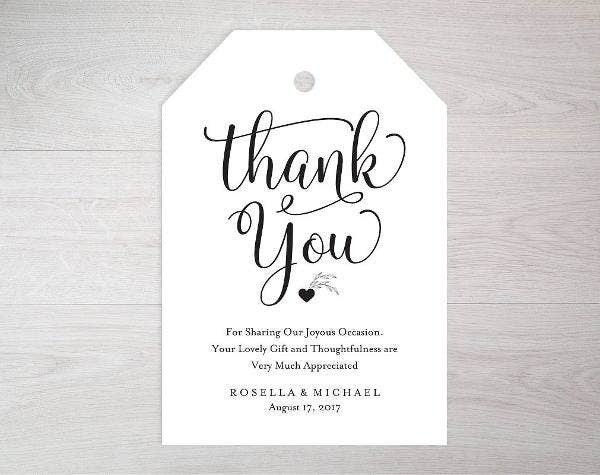 Bridal Shower Thank-You Tag. This girly tag with pink details is perfect beside your bachelorette party giveaways. 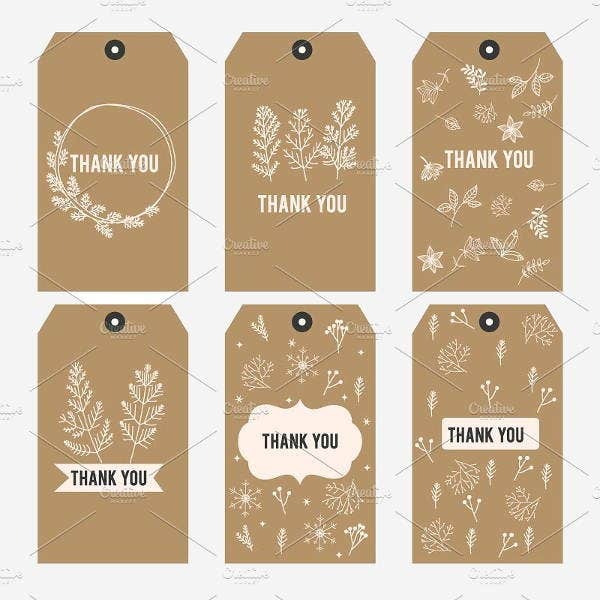 To maximize your thank-you tags’ effectiveness, make sure you hang it on giveaways which are placed in conspicuous places directly in front of your guests. In relation to all these, if you are planning on giving a gift to someone soon, you can also check our gallery of Gift Tag Templates.